PowerCo generators come complete with single skinned 8hr base fuel tanks on units rated upto 800kva, above this rating we recommend using remote mounting floor standing bulk fuel tanks which will give you stnadard or extender required running times. 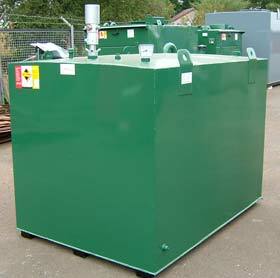 We offer bunded/double skinned fuel tanks on both base plate or remote configurations. A common option is to use a base fuel tank which is automatically filled from a remote bulk tank. A high and low level siwtch are mounted within the base tank, when both switches are down this starts a remote DC or AC fuel pump which starts to fill the base tank from the remote tank, only when both sitches are in the up position does the pump switch off. We also offer fire protection systems, the most common of which uses solder joints mounted on wires above the engine, should there be a fire the solder melts releasing a weighted valve which inturn shuts off the fuel to the engine. A mercury micro switch will also be activated which can be used to shutdown the genertaor and also trigger a fire extinguishing system. In areas where you may experience very low ambient temperatures we can supply fuel heaters as well as trace heating for pipework. POWERCO BUNDED FUEL TANKS- This range of Fuel tanks offers a simple solution to the problems generally encountered with providing watertight bunded areas around tanks. 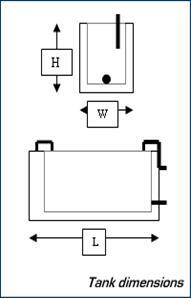 The bunded tank, of all steel construction, is a tank within a tank, the inner tank providing the required storage area, whilst the outer tank forms a watertight bund with capacity for 110% of the liquid stored. Suitable for the storage of bulk liquids such as diesel, heating oils, along with a variety of solvents and chemicals. For none sensitive environmental area’s we recommend the use single skinned steel fuel tanks. Both the inner and outer tank are constructed from 2mm steel plate. The inner tank providing the required storage area, the outer tank forms the required bund, with capacity for 110% of the total liquid being stored. -Hydrostatic remote mounting gauge on request.